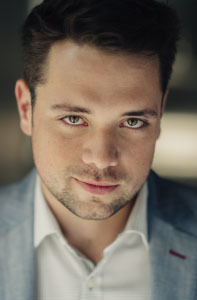 Winner of the first prize Operetta at the Concours International de Chant de Marseille 2017, Geoffroy Salvas was an artist in residence with the Atelier lyrique de l’Opéra de Montréal for the 2015-2016 and 2016-2017 seasons. He studied with Gabrielle Lavigne and Aline Kutan at the Conservatoire de musique de Montréal. His roles have included Le Gendarme (Les mamelles de Tirésias), Valentin (Faust), Le Vice-Roi (La Périchole), Don Giovanni (Don Giovanni), Morales (Carmen), Mercutio (Roméo et Juliette) . He also performed in Ein deutsches Requiem (Brahms), Petite Messe Solennelle (Rossini), Matthäus-Passion (Bach), Le Bal Masqué (Poulenc), Winterreise (Schubert), Leçons de Ténèbres (Couperin). Very active within the contemporary music scene in Montreal, he has visited the works of Dawe, Rickets, March and Bilodeau among others. Singing with ensembles such as the Opéra de Montréal, the Montreal Symphony Orchestra and Opéra de Québec have insured his ability to feel at ease on the opera as well as the concert stage.